How The Wilderness Society fell in love with a new content strategy. The Wilderness Society is using a new strategy to grow its Facebook Page—and save time to boot. In fact, more and more social media managers are finding success with this technique. The key to growing your Page is to regularly post great content, whether that’s your own unique content or shared content from other sources. The problem is, it’s hard to predict which posts will perform well with your audience. That’s why we developed a tool that changes all that. Inspiration finds proven, high-quality content and collects it all in one place for easy browsing. We asked The Wilderness Society (TWS) to walk us through their strategy and success with Inspiration. The Wilderness Society has built up one of the best-performing pages in the environmental community. Currently, their Facebook Page has 372,493 likes and it posts content 2–3 times a day. Inspiration has helped them continue the momentum. Inspiration focuses on over-performance, showing you only the best content in your network. For example, if you are looking at a Page that normally gets 50 likes per post and their newest post has 300 likes (600% over performance), that’s the content you should use. These daily checks have saved TWS a couple of hours each week, which they would have spent browsing Facebook to find great content. They now find and post 1–3 high-quality posts per week from Inspiration and see them resonate with their audience. 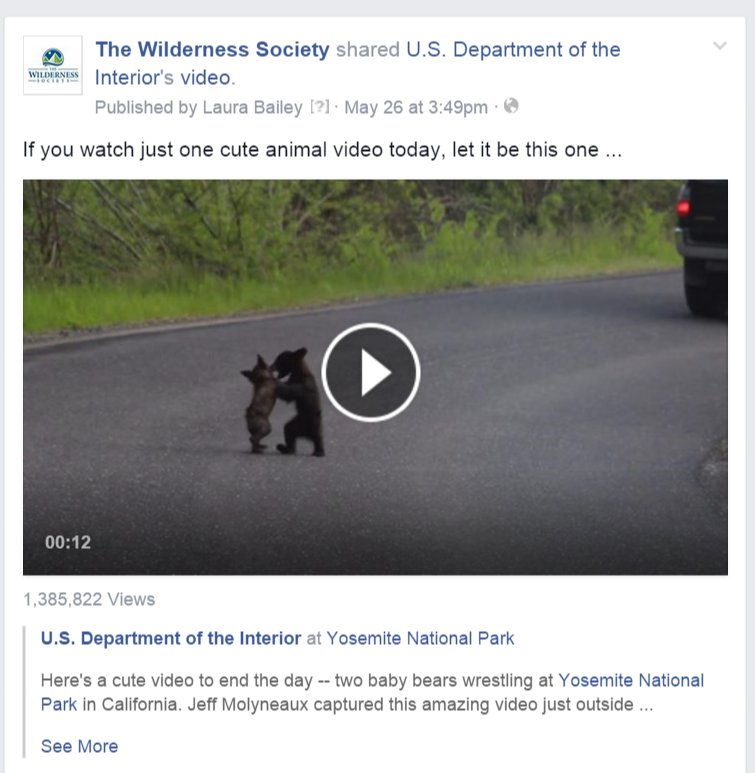 “We found this cute bear wrestling video from the Interior Department on Inspiration. It was our highest performing post of the week and inspired a high rate of commentary. Before Inspiration, it’s possible we may have found this post through a regular search of the DOI feed, but it’s also possible we would have missed it or come to it a day after it was posted." But Inspiration can be more than finding and posting great content. You can also draw “inspiration” from your feed and create unique new content based on what you find. The Pages you follow in Inspiration are not notified in any way that you follow them. This allows you to follow Pages that you normally wouldn’t publicly. The number one way to grow your Page is to consistently post over-performing content. Repost your own over-performing content and share others’ for maximum growth and engagement. Check Inspiration every day for greater success and growth. Follow Pages in Inspiration that you wouldn’t publicly, and practice social listening. Use Inspiration to learn what’s trending and to gain ideas for your own original content.